Our goal is to provide teachers with large classrooms the opportunity to provide authentic independent work while facilitating guided-reading and small-group instruction. The teacher will create a Google Class portal and NewsELA.com class. The teacher will be able to manage large classrooms effectively while facilitating small group instruction. Introduction: The first video provides an introduction to the mini unit. 2. Managing 33 students: In this second video watch a 10 minute lesson using 33 sixth graders in a public school setting. The lesson includes an introduction, small-group instruction with 5 students, and independent seat work for the rest of the class. 3. Interview with Kids: Listen as the students review their independent work. These two students were part of a group of five students that went into another class and worked one-on-one with fourth graders. These sessions went on for two weeks and were part of a push to roll out the technology into another grade level. 4. 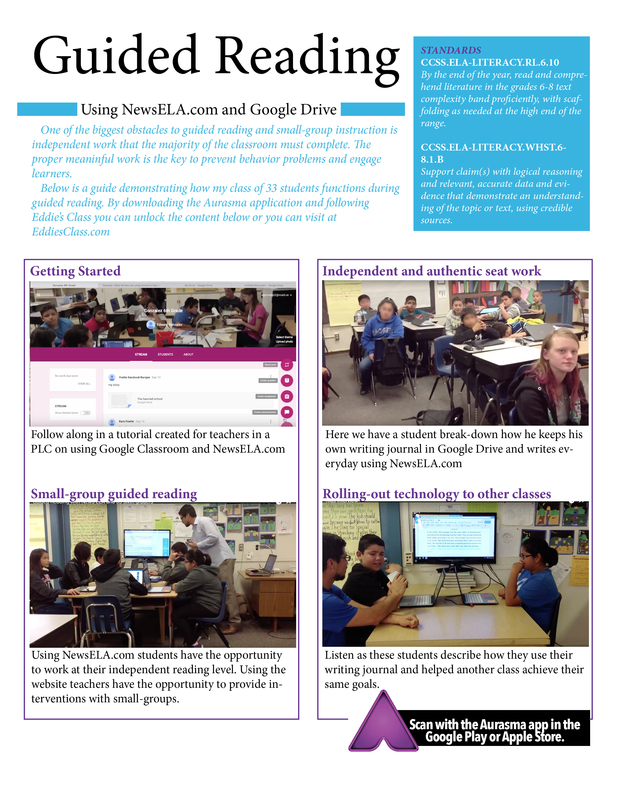 Learning the Websites: In this final I video walk you through creating your own Google Classroom and NewsELA.com account. I also review our class rubric to give you ideas for developing your own. For any questions or comments please email me directly or leave a comment below.